Having the best shoes for hiking when you’re out on the trail makes the experience so much better. Think about it: good grip, strong support, fewer aches and pains the next day. Don’t just look for a mens waterproof hiking boots sale! We did the research to find you some of the best brands and top-rated hiking shoes. Before we get into our hiking shoe review, let’s look at some of the features you need to know when shopping. 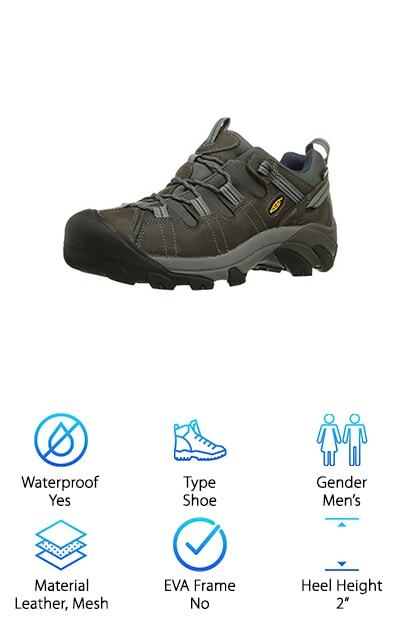 Waterproof: Waterproof hiking shoes are a great thing to have if you’re planning to explore in rain or snow or even by small streams and river. Water resistant shoes will work, too, but keep in mind they’re two different things! Type: We found boots, shoes, and even sandals that were all made to take on the trail. Boots are great all year round but perfect for cold weather. Sandals, on the other hand, are great for summer hikes. Gender: We found a mix of men’s and women’s hiking shoes for you. Keep in mind, though, if you’re a woman and a pair of men’s shoes strikes you, you can certainly wear them as long as you get the right fit. Material: These shoes are made out of everything from rubber to textiles to mesh. What you should look for is a shoe that’s waterproof or water resistant but also lets your foot breathe. Stay dry and cool. EVA Frame: EVA stands for ethylene vinyl acetate. It’s a lightweight material that is inexpensive and provides a lot of support and cushioning. It gives really sturdy support without adding weight. In other words, ideal for hiking shoes. Heel Height: Low heel height is usually best because you’re closer to the ground for better stance and stability. Some shoes that have a higher heel height also have a thick sole altogether so you’ll still get the right grip. 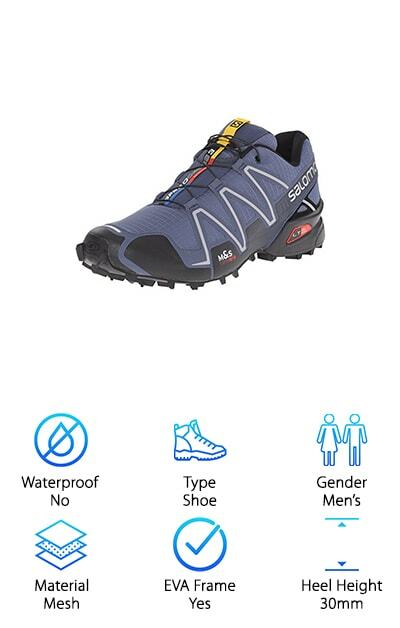 Now that you know more about the important features of hiking shoes, let’s get right into our reviews. Whether you’re looking for hiking shoes deals or just want the best pair you can find, our picks will help you find a great pair that will serve you well on the trail. If you’re in a hurry, check out our top and budget picks first. But stick around if you can! The rest of our picks are pretty great, too! Ok, let’s go. Our top pick is the Merrell Men’s Moab Hiking Shoe for men. They’re not completely waterproof but they are water resistant, which is more than enough protection for a general hike in mild weather. The uppers are made of water-resistant leather and mesh that allows your foot to breathe. There’s also a rubber bumper to protect you from rocks, stumps, and logs that might show up unexpectedly in your path. One thing that makes these shoes really comfortable is the design of the lug pattern. It’s deep grooves and circles help you get a good grip in all conditions while the arch is left smooth so it can flex naturally. And we have to say, we love the sweat prevention and microbial agents that keep these shoes smelling fresh. If you’re looking for good cheap hiking shoes, the Northside Burke II Sandal is worth a closer look. 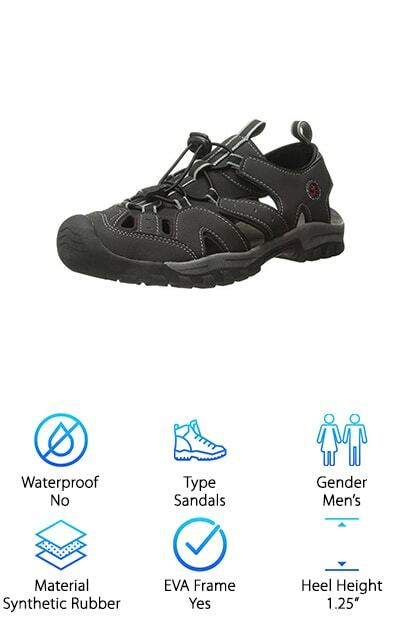 They’re a closed-toe sandal with a protective rubber toe guard to keep your feet protected from rocks, twigs, or anything else that you might bang your toes against as you walk down the trail. The upper shoe is water-resistant and has a bungee cord closure so you can adjust them to get a perfect fit. The sole of the shoe is grippy so they’re just as good on the trail as they are along the shore. This isn’t a true sandal; we think it’s more of a combination of a sandal and a really awesome hiking shoe. And get this. They’re even available in 5 different color combos, including charcoal and brown camo. These KEEN hiking sandals are an amazing pair of women’s hiking shoes. One of the things we loved most about them is they’re available in 20 different colors! They’re waterproof thanks to the hydrophobic mesh lining. The rubber sole is non-marking and has a sturdy lug pattern so it gives you great grip and traction. KEEN put a lot of thought into the foot bed design, too. It gives great arch support and takes into account the natural contours of your foot. That means longer hikes with less discomfort. The lacing system is effective. It really makes you feel like the shoe is snug on your foot while remaining adjustable so you can loosen and tighten it if you have to. And of course, we love the Cleansport NXT and odor-reducing Aegis Microbe Shield. Who wants a smelly shoe? 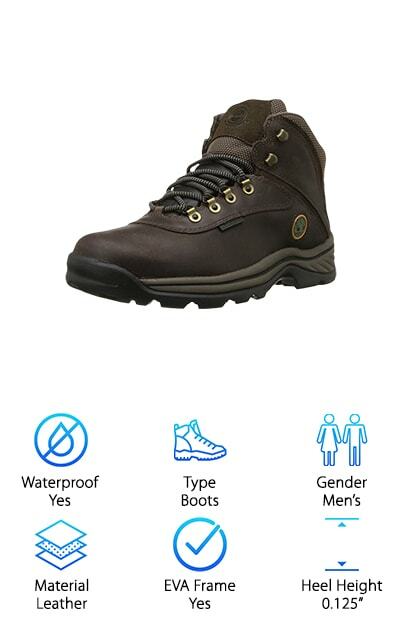 Timberland is a well-known brand and these White Ledge Boots are certainly not cheap waterproof hiking boots. What they are is affordable and extremely well made. Seriously, there is so much to love about this boot. For starters, the leather is waterproof and seam-sealed. What does that mean? You’re completely protected from both rain and streams or other water you might come in contact with. To keep your feet cool, the foot bed is breathable so air can circulate. And that’s not all. It also wicks away moisture to keep your feet dry and reduce any bad odors, too. The rubber lugs help you maneuver with ease because they were specially designed to work with the natural motion of your foot. We really liked the padded collar and tongue, too. They keep your ankles comfy and protected. 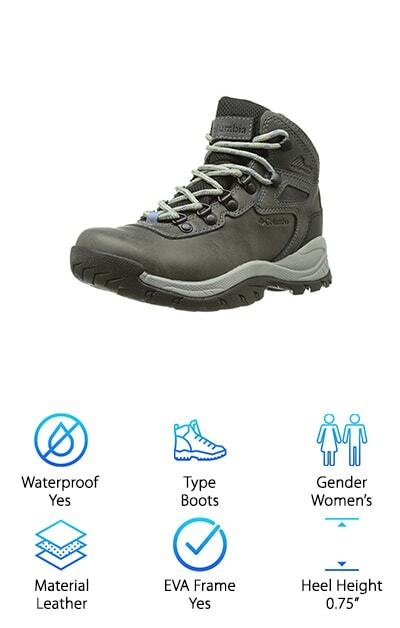 For ladies looking for a great waterproof hiking boot, check out the Columbia Newton Ridge Boot. The full grain leather is treated so it’s not only waterproof but stain proof, too. You don’t need of worry about morning dew, rain showers, or stepping through a stream. What we really liked, though, is how breathable they are even though they don’t let in a drop of water! The EVA foam midsole is both supportive and comfortable so you’ll be able to go the extra mile. D-rings line the bottom of the shoe with 2 clamshells on each side at the top let you adjust the laces to your liking. To help you cover a range of terrain, the Omni-Grip tread helps you keep a firm grip so you can feel confident moving from muddy areas to more elevated terrains. Running on a trail is so much better than a treadmill or a sidewalk as long as you have the right shoes to support you. If you need a great pair, take a close look at the Salomon Trail Running Shoe. They have a water-resistant, anti-debris upper that keeps your feet dry and clean while you’re on the go. Plus, they fit like a glove and the Quicklace system means you spend less time adjusting and more time running. Because you never know what your feet might bump into on the trail, the protective rubber toe cap keeps your toes safe. The soles are amazing and even get a good grip in mud and snow. In fact, they were made for fit and grip, 2 of the most important elements of a great trail running shoe. The Ahnu Women’s Hiking Boot is special because of the way it was designed. What do we mean by that? They’re made to support the way that your foot moves naturally which means you move with a stable, more balanced stride. To put it simply, they’re really comfortable. They’re made of leather accents on a textile upper with a tight, waterproof honeycomb pattern. The rubber sole gives you a great grip without appearing too chunky. They also provide a decent amount of ankle support, too, thanks to the mid-cut design and padded collar. And that’s not all. They come in 8 different color combinations. They’re fun, too, like deep teal with gray leather accents and a maroon sole and light gray with bright yellow stitching and a teal sole. We love that they let you express yourself. Maybe hiking boots aren’t your thing but you still need a great pair of shoes to wear out on the trail. 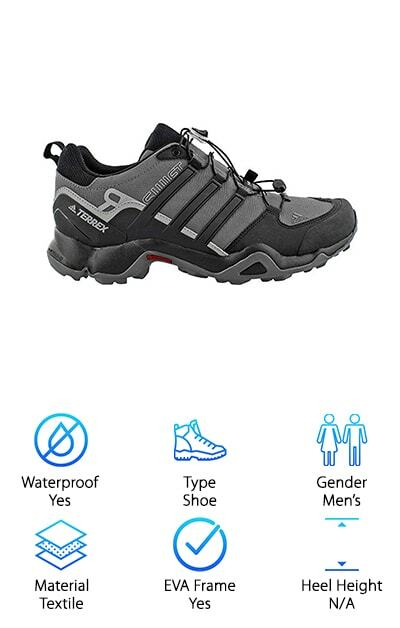 Well, Adidas has you covered with their Terrex Hiking Shoes. They look like sneakers but they were made for hiking. The high traction rubber sole has a superior grip, even in wet conditions. Plus, they’re lightweight and breathable so you kind of feel like you’re not wearing shoes. The inside is cushioned with Adiprene while the Gore-Tex lining keeps them completely waterproof. For a snug and fast fit, the bungee lacing system works like a charm. Plus, your toes are protected thanks to the molded rubber toe cap. They’re also available in a wide range of colors, everything from black with bright green accents to brown with a pop of orange to basic black and gray. Another great pair of trail running shoes comes from Tesla. We love the durable, rugged design and were surprised at how streamlined they managed to be. The uppers are made of mesh, PU, and some nylon and synthetic leather accents. These shoes are durable and don’t wear and tear easily. They can stand up to a lot of different outdoor environments. That’s not all, the outsole also has really good grip that helps you keep stable footing even in harsh conditions. They’re really comfy, too, thanks to the ergonomically form-fitting design. A shock absorbing midsole and reinforced heel cup support your foot, too, so you won’t get sore as you push yourself on your run. One more thing. These shoes are really affordable and they come in a range of different colors. KEEN is a great brand when it comes to the outdoors and these hiking shoes are a great example of why. The uppers were designed to last, even if you wear them every single day. They’re made of waterproof nubuck leather and hydrophobic mesh so they will definitely keep you dry. That’s not all. They’re also really durable and built to last. Plus, they’re still breathable and keep your foot cool and comfortable while you climb. To help keep the inside of the shoe soft, there’s a padded tongue and collar. Plus, there’s a large rubber toe guard to keep your foot safe from anything you might bump into on the trail. As far as grip, the rubber sole is great in snow and mud. The lugs really work well on a variety of terrain.